Starring Kenneth Anger, Peter Kubelka, Alfred Leslie, Gerard Malanga, Jonas Mekas, Joseph J. Menkevich, Billy Name, Mary Woronov (interviewed); Stan Brakhage, Marie Menken, Andy Warhol (archive footage). Back before home video we'd occasionally see an avant-garde film program, perhaps circulating on 16mm and showing at a library or college. The movies either excited us half-baked film students or left us cold; we wouldn't admit it, but we'd attend to compare our film ideas with those of the "pros". Unless one subscribed to specialized arts 'zines or were conversant with the art scenes in New York or San Francisco, the makers of these films were very mysterious. We'd see names like Stan Brakhage and Ed Emshwiller crop up but knew absolutely nothing about them. If somebody handed out mimeographed program notes, chances are they'd mostly be excerpts of superlative reviews, often by other underground art filmmakers. Martha Kudlácek's Notes on Marie Menken peels the mystery from a noted New York artist who dabbled in art films that have become highly regarded. 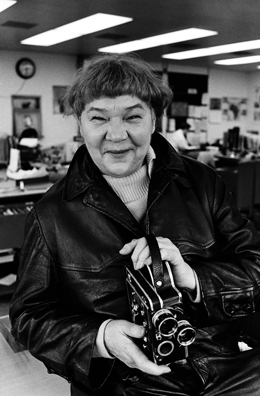 One needs to interpret the terms "noted" and "highly regarded", which only means that I've seen Ms. Menken's name raised many times in a positive context; any discussion of East Coast avant-garde filmmakers will usually bring her into the picture. I've studied and reviewed impressive DVD collections of avant-garde films and Menken seems one of the more interesting names. The documentary gathers eight noted participants in the film scene in the 1960s, including some known previously only as disembodied names in homemade credits. Sage survivor Jonas Mekas (Notes on the Circus) is seen going through a storage facility wherein lie years of Marie Menken's art experiments, publicity handouts and rusty cans of un-catalogued 16mm film. Standing on a snowy sidewalk or sitting in front of a cold New York loft window, Mekas talks about Menken in affectionate terms. The other "star" name is Kenneth Anger, who remembers Menken as a pioneer and an inspiration; Anger was staying with Menken when he happened to bump into the motorcycle club that became the subject of his film Scorpio Rising. The picture that emerges of Marie Menken fleshes out interesting biographical details that have been repeated ad infinitum. Unlike most of the artists associated with the New York underground scene of the 1960s, especially the Andy Warhol Factory crowd, Menken was of an older generation. She was married to Willard Maas, an educator, experimental filmmaker and poet. Their relationship is described by several witnesses as rocky, loud, abusive but strangely stable -- as if their shouting and taunting during long party weekends had evolved into a relationship / performance art. Both had jobs. Willard taught college literature courses and Marie worked the night shift organizing incoming cables and copy for the staff of Time magazine. Their 16mm art films were all after-hours projects. The fact that the Menkens had a permanent address and steady incomes was all it took to make them a hub for younger artists, if only because they'd put people up who came from out of town. The Menken apartment was an avant-garde salon. The weapon of choice for these bohemian filmmakers was the 16mm Bolex. Many of their films were one-print-only camera originals hot spliced. At first shown only to friends and other artists, Marie's films were screened mostly in intimate venues. The artists became better at self-promotion. Jonas Mekas gained a review pulpit in the Village Voice, further cultivating their notoriety. Finally came the establishment of Andy Warhol's Factory, which generated as much publicity as it did artwork and became (at least for Warhol) a highly profitable enterprise. Actors and artists contributed to the Factory "scene" for free; Warhol's payment was making them famous, or in some cases infamous. Several of the interviewees are alumni of the Factory -- Gerard Malanga, Billy Name, Mary Woronov. Stan Brakhage is seen painting a strip of film while praising Ms. Menken's influence. Austrian filmmaker Peter Kubelka's fast-talking interview seems out of place only because he's not on the same nostalgic wavelength as the other participants. We see Ms. Menken in stills and in snippets of films; one partially decomposed film turns out to be a "duel of Bolexes" between Marie and a pre-Factory Andy Warhol on the rooftop of her apartment building. Menken is tall, heavy and has a pleasant face when she smiles, but she indeed looks as if she'd be mean when drunk. We see excerpts of her films, all of which have positive visual qualities in the choice of subjects -- a garden in flower, the Moorish architecture of a Spanish palace. Her frequently handheld style is dominated by dizzying movements that suggest using the camera as a cinematic paintbrush. We can picture Menken happily swinging the camera about as if conducting inner music. It all seems a very limited bag of tricks but other filmmakers rush to tell us how her work inspired them. In terms of freeing one's self to express feelings on film, we agree. Another film sampled is simply a time-lapse record of activity on the East River as seen from Menken's rooftop. It's considered a classic, but we also suspect that the idea was carried out after purchasing a single-frame trigger to attach to her Bolex. 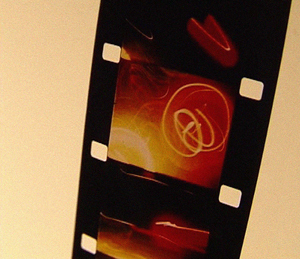 How many of us did the exact same thing in Super-8, simply because we could? Notes on Marie Menken does give us a good picture of a New York scene crowded with unemployed or barely employed artistic types looking for a support system to allow them to pursue their work. By the time the Warhol organization was put together Marie was an established star name. She appeared in two of Warhol's films, including 1965's Chelsea Girls. More than one interviewee comments on Marie and Willard's most lasting contribution to art culture: playwright Edward Albee was a frequent guest at their "long weekend" drinking parties and carefully observed the married couple's marathon bouts of exhibition-grade bickering and insults. They became the models for Martha and George in Albee's play Who's Afraid of Virginia Woolf? 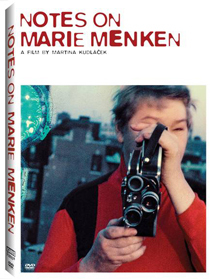 Icarus Films' DVD of Martina Kudlácek's Notes on Marie Menken gets about as close to its subject as is possible, using every scrap of recorded audio, film and stills of Menken that can be found. Noted composer John Zorn provides the film score. The cover art is a blow-up from The Duel of the Bolexes. The new interviews have clear audio, even though Jonas Mekas' accent is at times tough to decipher. We travel with Gerard Malanga to the site of Marie Menken's grave -- she passed away in 1970. The disc Bous content includes good quality transfers of three of Menken's films excerpted in the show itself. Visual Variations on Noguchi is a close-up study of a sculptor's work. Arabesque for Kenneth Anger is the film-response to the beautiful architectural details of the Spanish palace. Glimpse of the Garden intersperses pans across flowers with large macro close-ups. In 2007 it became part of the Film Registry in the Library of Congress. Narrative films about the Warhol crowd have naturally gravitated toward the sensational and more notorious aspects of the avant-garde scene in New York, which makes Martina Kudlácek's docu doubly notable as an affectionate and honest look at how it all really was. It's an excellent show for those interested in the era.